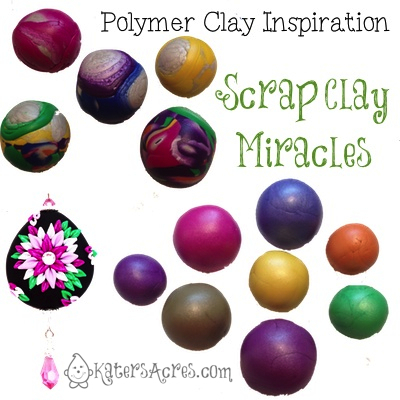 Transform Scrap Clay into Gorgeous New Colors: Scrap Clay Miracles! This past week I had a guest in my studio. They saw this unique and lovely colored bunch of clay on the back of my work surface and stated, “WOW! How did you get those colors? !” I laughed and said, “It’s scrap clay!” Needless to say, they didn’t believe me. If you haven’t figured it out by now, I love to write about scrap clay and how you can reuse it and do something wonderful with it…so today’s post is all about what I did with my scrap clay and how I got those beautiful colors to make more colorful things. You know how you took all that time to make a beautifully matched and coordinated color palette? Remember how many hours that took? For the photo here at left, these 2 oz. skinner blend bullseye canes took me almost 3 hours. By the time I blended by my colors so they would coordinate, to making the skinner blends, to rolling the canes … 3 hours had gone by. Honestly, I thought that was pretty quick work for all that! 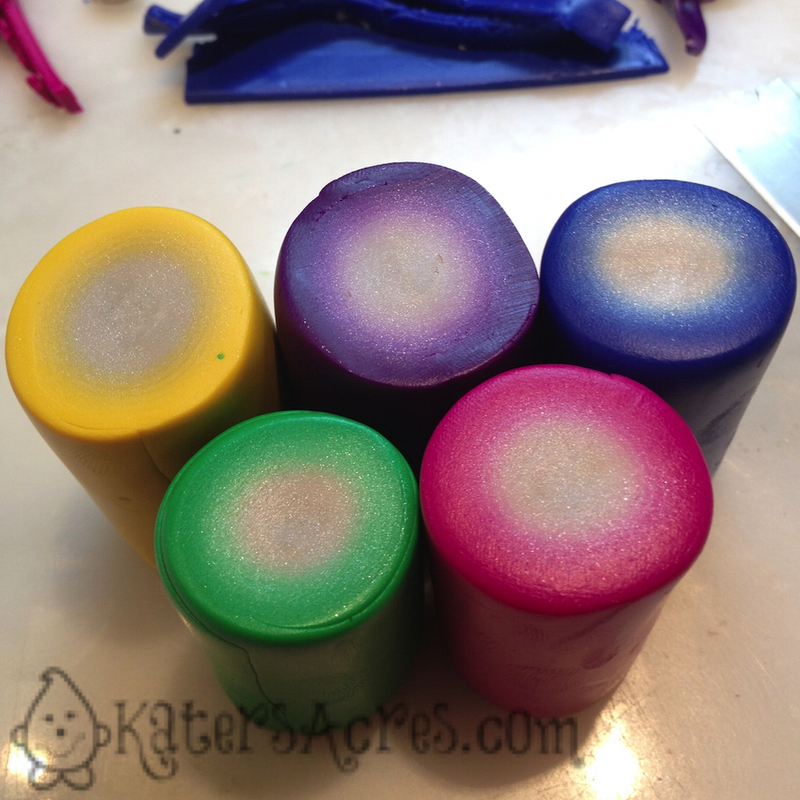 The result of all these blends was all these cute FISHIE CANES! After 8 hours of making canes, I ended up with a huge pile of scrap slices that covered approximately 1/2 of my working surface. Now, I very easily could have thrown this clay into my scrap bin (at right). But I had spend all that time making sure that this palette was color coordinated, it seemed like a horrible waste of time, energy, & effort. So instead I decided to gather all my scraps into color piles based on their strongest & majority of colors, included the cane end slices that had all the colors in them. I apologize as I did not take a picture of all the combined balls, this was in the middle of the separation process. You can see slices of the fish canes in the scrap clay balls if you look closely. Here’s proof that with a little forethought, energy, & effort you can save every bit of that unused clay if you take the 20 extra minutes to do this at the end of every project. These balls weighed a total of 3 oz. when I was finished. That’s 1 1/2 blocks of clay that would have hit the scrap pile. But here’s the best part yet, the two photos below I made from all this scrap clay. The only added colors were black & white to tint & tone the blends to make new color variations. What kinds of things would you make with your next batch of scrap clay? Feel free to post your creations on my Facebook page and show everyone what you have made! I hope today’s scrap clay ideas help you get back into your studio this weekend & repurpose what would normally go in your “mud” scrap. Thanks for joining me today and don’t forget to sign up for more tutorials, prompts, and projects direct to your email. Sign up now. I love your scrap clay pendants! I make a lot of Natasha beads and Stroppel canes with mine, but you have given me some new ideas for those containers of scraps I have!